It seems that miracles do happen occasionally as I actually won something on the lottery on Saturday so what better way to spend my £25 than towards a morning boat at Chew after the Crocs? There have been some very encouraging reports from Chew recently and with the weather forecast suggesting an overcast morning things were looking good. However as i set off across the lake the clouds departed to leave a bright sun which dampened my confidence no end. There were four other pike boats out and they set off for the top end of the lake so i decided to try Herons in the hope that the lack of pressure might pay off. The water clarity wasn't great at between 3 and 4 feet at best but it was a degree or so cooler at 19 decrees which was good news. The first couple of drifts proved fruitless and I feared my second consecutive blank was on the cards and then some cloud cover rolled across the sun and as it by magic I got my first take of the day few seconds later. The fish was extremely lively and did and impressive tailwalk during the fight and then leapt out of my net (bad angling) before it eventually gave me best. It was a deep fish that took my scales down to 10-4 so it was worth the wait. After a cup of tea I set up another drift and had a follow on my first cast, but that was it for Herons so I decided to have a look at Moreton for a few hours. That proved fruitless so as time was moving on I tried a couple of drifts off Nunnery Point which gave me my second fish of the day - a 5lb 10oz Jack. After another drift in Villice came to nothing it was 2.30pm and time to come in . So not too bad a morning and its always fun to catch a tailwalker! A good result considering the water temp. 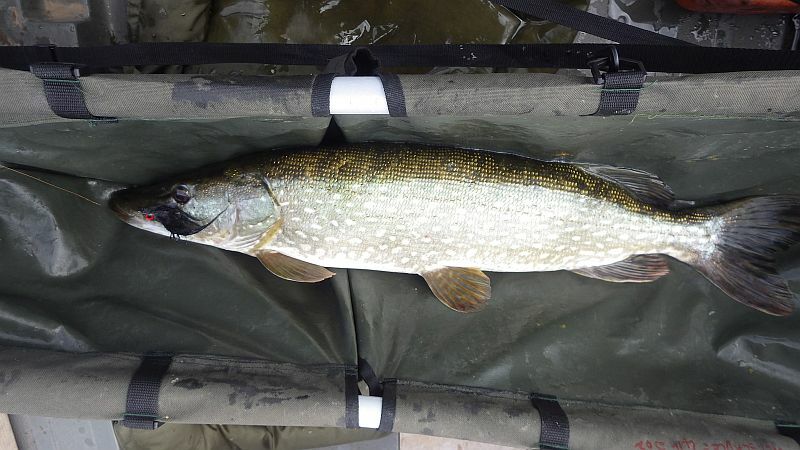 Tony Lakefisher and I shared a pike boat today on Chew on what at first looked like being a very wet morning. Fortunately the heavy rain died out shortly after we picked up our ticket to leave a mainly dry morning with an overcast sky and gentle breeze. This led me to think our luck was in especially when on only the second cast I felt a pike tug my fly a couple of times on the way back to the boat. I continued the retrieve hoping for everything to lock up but by the end of the cast I could see why it hadn't - there was a tiny Croc of no more than a pound hanging on to its prize for dear life! 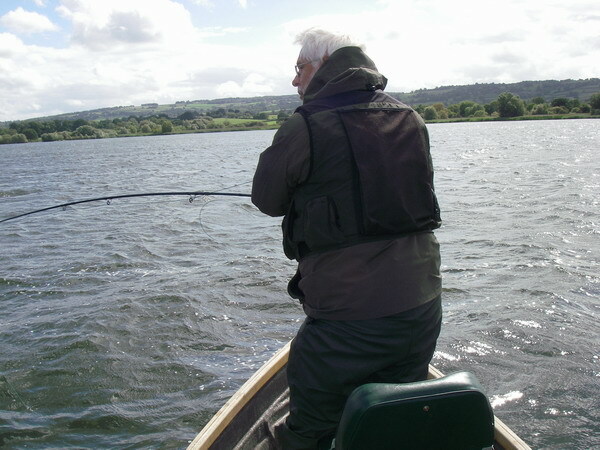 After that we did numerous drifts with no more excitement apart from some abortive taps and a follow for Tony, and something on the hang for me that was either very small or a trout going by the boil on the surface. As the day wore on the gentle breeze and overcast sky was replaced by something a lot stronger and brighter which didn't fill us full of confidence. In fact I had reached the point where I was convinced we were going to blank when a pike hit my fly hard, pulling my rod over into an ominous looking hoop where is stayed for most of the fight! Although I gave her plenty of stick she stayed deep and I couldn't do anything with her to start with but eventually the pressure took its toll and she was ready for the net. If she had shed the hook at that point both Tony and I would have said she was a 20 but the scales don't lie and they confirmed her weight at 16lb. Was I disappointed? Not at all - she gave me a helluva fight and went back very strongly and you cant really ask more than that. We carried on for a few more hours but the gusty wind and bright sky was taking its toll so we both decided to give it best at 6pm. Seems that Tony and I take it in turns to catch or blank and this time it was my turn to catch. No doubt next time it will be Tony's turn. Thanks for the reports Alan! Few big pike put this week. Frustrating when the sun and wind come up! Cheers. 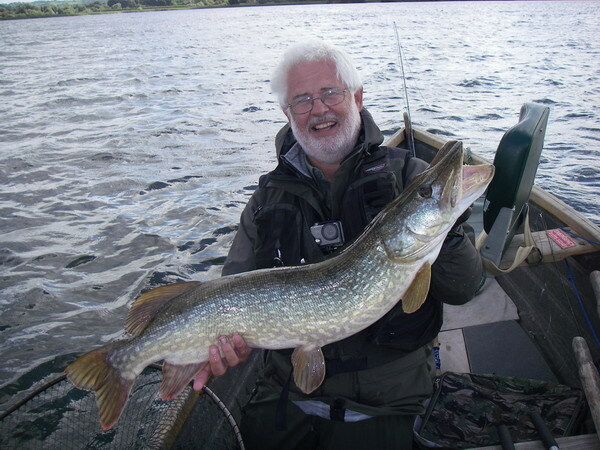 I am surprised that B.W have not put a halt on pike fishing during the hot conditions. One would have thought that they would want to keep their golden eggs in prime condition. That said, well done Alan it is a good fish to tempt at this time of year. No worries with the water temperature yesterday - was a reasonable 19 degrees, and according to the stats from BW, with good oxygen saturation. 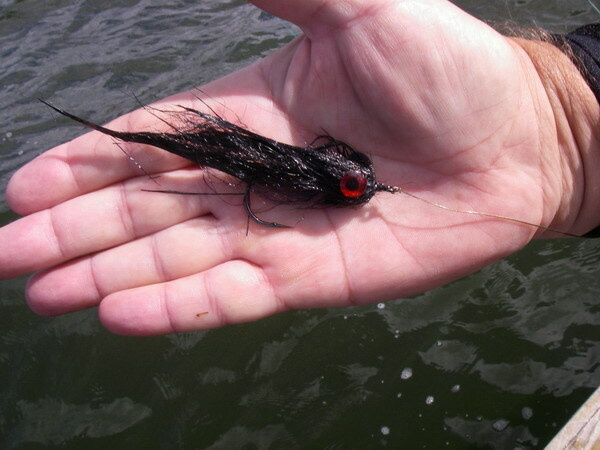 Unfortunately, all I managed on our day afloat was a couple of follows - one around 8/10 pounds that gave me 2 failed hits - and a huge girl, around 25+ pounds, that just glared at my fly beside our boat.